Microtia can have a significant physical and psychological impact on your child. A missing or malformed outer ear can affect their appearance and self-confidence, and a narrowed or nonexistent ear canal can have more far-reaching effects on their hearing, speech patterns, and language processing skills. Fortunately, Dr. John Reinisch and Dr. Youssef Tahiri perform microtia surgery at our Beverly Hills practice – the MEDPOR® or OMNIPORE® ear reconstruction technique. This technique was pioneered in 1991 by Dr. Reinisch. It uses a microporous high-density polyethylene implant. To learn more about these procedures and find out which one might be right for your child, schedule a consultation with Dr. Reinisch or Dr. Tahiri. Microtia is a rare congenital condition that affects approximately one in every 8,000-10,000 babies born in the U.S. Microtia rates are slightly higher in other parts of the world, and thanks to their reputation for excellence and comprehensive treatment, Dr. Reinisch and Dr. Tahiri work with patients from around the globe. Microtia surgery is designed to address both external ear deformity and inner ear canal deficiency. By using a patient’s own tissue, Dr. Reinisch and Dr. Tahiri can create a new ear structure. They also work with a top otologist, Dr. Roberson, who can surgically create or correct the ear canal to improve hearing. The purpose of outer ear reconstruction is the restoration of craniofacial balance by creating an aesthetically pleasing, symmetric and long-lasting pinna. Ear reconstruction should be considered an aesthetic procedure and its results should be held to the same critical standards as other cosmetic surgeries. After having performed multiple techniques for ear reconstructions, Dr. Tahiri and Dr. Reinisch decided to only perform Medpor Ear Reconstruction; technique that was popularized by Dr. John Reinisch in 1991. Dr. Tahiri and Dr. Reinisch have an extensive experience in Medpor ear reconstruction and are considered the world experts in ear reconstruction. 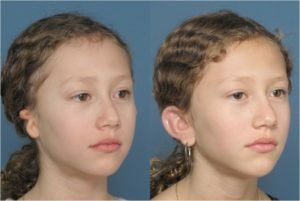 Although there has been a well-established surgical microtia treatment for over 55 years, Dr. John Reinisch saw a need to create a more advanced surgical technique that could provide improved cosmetic results, and allow children to receive treatment with less discomfort and at an earlier age. In 1991, he introduced a newer technique, known as MEDPOR® ear reconstruction. Located in Beverly Hills, patients travel to our practice from around the world to receive this advanced treatment. During the procedure, Dr. Reinisch and Dr. Tahiri creates a polyethylene framework and grafts a patient’s own skin over the structure. The safe, effective technique offers a number of benefits. It is suitable for patients aged three and above, and has been used to successfully treat patients in their 50’s and 60’s. To learn more about MEDPOR® or OMNIPORE® treatment and you or your child’s suitability for the procedure, contact Dr. Reinisch or Dr. Tahiri today. The traditional method of ear reconstruction has utilized an ear framework made from rib cartilage. Refinements of the cartilage procedure over the years have reduced the number of needed surgical stages. However, the amount of required harvested cartilage has increased, pushing back the age of reconstruction until 10 years of age or older. 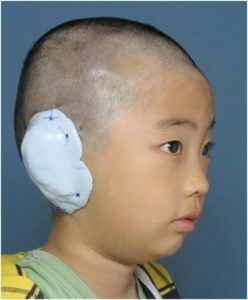 Reconstruction at an older age, and its usual multiple stages, have made microtia reconstruction with autologous cartilage a more arduous physical and psychological endeavor for both children and their parents. If the final cosmetic result of the constructed ear is not ideal, the entire reconstructive journey can be disappointing. The use of an alloplastic framework covered by a thin temporo-parietal fascia flap offers several advantages over the traditional method of cartilage reconstruction. Since ears reach 85 percent of adult size by 3.5 years, ear reconstruction can be performed at a younger age since the need for sufficient costal cartilage is not a factor. Other advantages of a fascia covered alloplastic framework over the traditional rib cartilage technique include minimal patient discomfort, single outpatient procedure, and better ear definition and projection. Candidates for Medpor implant reconstruction include patients with congenital microtia, as well as patients with a traumatic loss of their ear or a prior unsatisfactory ear reconstruction. Patients must have either an intact superficial temporal artery supplying the superficial temporal-parietal fascia or a patent occipital artery supplying the occipital parietal fascia. Free fascia flaps with a radial forearm fascia or a free contralateral TPF flap are possible in the rare case, in which no local arterial fascia flaps are available. Conditions that would be contraindications for traditional rib reconstruction (low hair line, mastoid scaring, or a previous atresia repair) are not contraindications for Medpor ear reconstruction if the entire implant can be covered with well-vascularized fascia. MEDPOR®, short for microporous high-density polyethylene implant, is 100% biocompatible, and since its introduction twenty years ago, has been used successfully in over 250,000 reconstructive, cranial, and cosmetic surgeries. Prior to the procedure, Dr. Reinisch or Dr. Tahiri will create the MEDPOR® ear framework, which is modified in a way to match the shape and projection of the opposite, normal ear, eliminating the need for a future ear pinning surgery. MEDPOR® surgery is performed under general anesthesia. For optimal patient safety, Dr. Reinisch and Dr. Tahiri work with several pediatric anesthesiologists. Once the new ear is in place, they will graft skin over the new structure, usually from beneath the patient’s scalp. Because the MEDPOR® framework is porous, surrounding blood vessels and skin can integrate with the material, making it a living part of the body. The Medpor or Omnipore ear reconstruction is a very complex procedure that only very few surgeons in the world can perform while obtaining a good outcome. The procedure is performed as an outpatient procedure. While the harvest and assembly of the framework is the most challenging and time-consuming component of the rib ear reconstruction procedure, the most critical component of the alloplastic reconstruction is the soft tissue coverage of the framework. As long as a healthy fascia flap covers the implant without tension, an alloplastic reconstruction can be done with minimal complications. 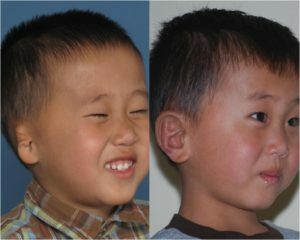 In addition, the ability to complete the procedure in a single, outpatient procedure before starting school is a very appealing feature of alloplastic ear reconstruction. The fascia we typically harvest is the superficial temporal fascia flap that is located under the scalp. This fascia is harvested using the same incision we use for the ear reconstruction. Since we have a lot of experience harvesting this flap, we do not need to perform a scalp incision, obviating scalp alopecia. This requires additional time and effort using a headlamp, high-power loupe magnification, and custom retractors and varying lengths and configurations of instruments. MEDPOR® ear reconstruction is a single-stage surgery and boasts numerous advantages over the traditional procedure, leading many experts to believe it is the best surgical option for microtia. Perhaps the most notable advantage of the procedure is that it can be performed at such a young age. Ear canal repair may be performed before or during MEDPOR® surgery. By addressing aural atresia at an early age, children can have better hearing at the same time that their peers are processing and learning language, and they will have a lower chance of developing speech disorders and difficulties with language. Moreover, by having the cosmetic aspects of microtia addressed before they start school, children can face less psychological distress. Finally, because the MEDPOR® structure is bonded with a patient’s own tissue, it is typically very sturdy, so patients will be able to participate in the same sports and activities as their friends. The advanced nature of MEDPOR® surgery typically results in less scarring than traditional surgical techniques. When Dr. Tahiri and Dr. Reinisch create the ear framework, it will be constructed to be the same size as an adult ear. Although it may look slightly large for several years, young patients will have a natural appearance, increased self-confidence, and often, enhanced hearing for the rest of their lives. Following surgery, Dr. Reinisch or Dr. Tahiri will place a protective silicone cover over the new ear to aid in healing and encourage proper contouring. Patients will have at least two follow-up appointments – the first one to two days after surgery and the second about two weeks later. The first post-operative appointment occurs at post-op day #2 or #3. The absorptive dressing is removed during this appointment. If fluid is noticed beneath the scalp at that time, it can be easily drained percutaneously with a butterfly needle. The silicone ear splint is left in place for a total of two weeks post-operatively. During that period, the head should be kept dry and patient should not sleep on the side of surgery to avoid pressure on the reconstructed ear. For young children, parents should sleep with the child to make sure they do not inadvertently turn and sleep on the operated side. At two weeks post-operatively, the silicone ear mold is removed and the ear and head are washed with shampoo in the office. Parents are shown how to wash it gently with their fingers on a daily fashion. A new silicone ear mold is made for the patient to use at night for the following four months. A light coating of ointment is applied on the ear before applying the ear mold for the next week. The third post-operative visit occurs after three weeks. Washing can now be done with a gauze pad to encourage removal of the dissolving chromic sutures. Parents are taught how to make the silicone ear mold, which will be worn every night for the following four months (parents are provided with the silicone mold packets). This helps to protect the ear, but more importantly, it helps to maintain the projection of the ear. In the hands of Dr. Reinisch and Dr. Tahiri, complications associated with Medpor or Omnipore Ear Reconstruction are rare. The overall complication rate ranges between 0.5 percent to 4 percent. These complications include implant exposure or extrusion (4 percent), implant fracture (<1 percent), infection (<1 percent), loss of the ear reconstruction (<0.5 percent). To learn more about MEDPOR® ear reconstruction and how it could benefit you or your child, schedule a consultation with Dr. Reinisch and/or Dr. Tahiri today.